Just as I do at the end of every year, this past December I wrote down a list of goals for 2014. This time, though, I did things a bit differently. This time I wrote my goals as declarations not aspirations. So instead of writing "I want to land my own column in a local print publication," I wrote "I will land my own column in a local print publication." And by January 31 I had done exactly that. I am now a columnist for B-Metro magazine. My first piece ran in this month's issue and addresses the issue of whether or not there is a feminist aesthetic. In other words, can you tell a person is a feminist by looking at her? My column, called Write Like a Girl, will tackle everyday feminism and women's issues each month. 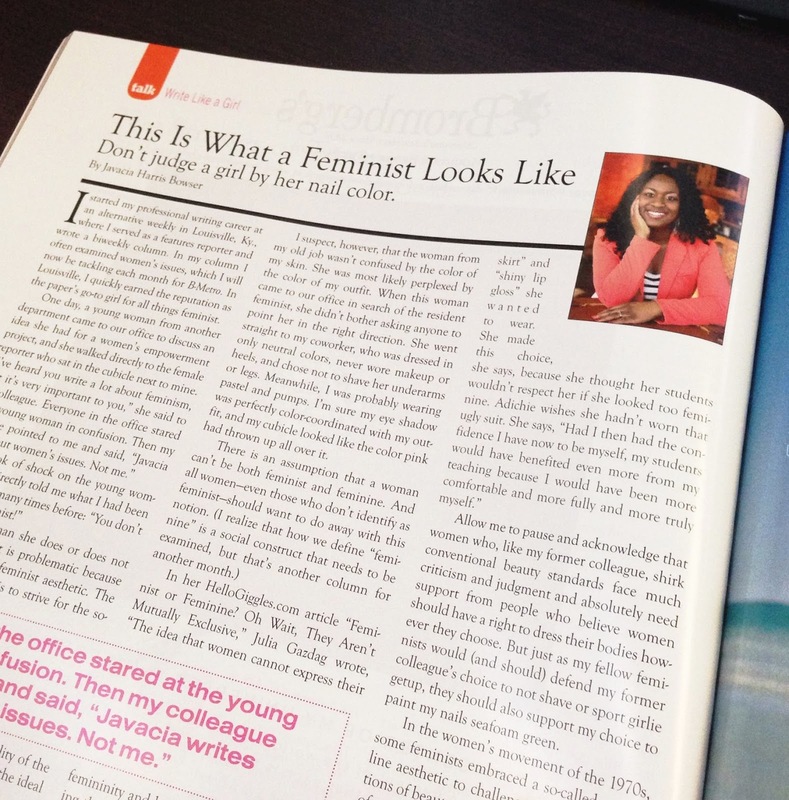 You can read my debut piece "This Is What a Feminist Looks Like" here. When I wrote down my declaration last year I also determined that once I did snag this column opportunity I would write a post about how I did it. In the post I would examine the anatomy of the perfect pitch. But I didn't write the perfect pitch. In fact, I didn't write any pitch. I was actually offered this opportunity before I had the chance to ask for it. Nonetheless, I do have a few tips to offer. Believe in your goals. I'm a woman of faith. If you're not, this tip might sound a bit weird, but it's similar to concepts explored in books like The Secret. I truly think that one reason I got this opportunity is because I believed I would. I had faith, faith that I displayed by writing out this goal as a declaration and not simply as an aspiration. Share your goals. I also believe in the power of simply saying your dreams out loud. You have to be careful with this. You can't share your dreams with everyone. Some people are haters and will discourage you from going after your goals. But I am fortunate enough to have a group of women in my life who support me, women I met through See Jane Write. One evening at a coffee shop in Homewood I shared my dream with my pal Tanya Sylvan. The glow in her eyes showed she believed I could achieve this as much as I did and that gave me the confidence boost I needed to enter the new year with boldness. Furthermore, sharing your dreams can help in a practical sense as your friends can let you know when they learn of opportunities that may help you with your goals. Support the goals of others. I have this mantra about blogging that I often preach: Focus on people, not page views. Some may think that the editors of B-Metro approached me about writing a column because I have a wildly popular blog that gets millions of page views each month. I do not. But this little blog you're reading right now is part of a bigger project. For the past three years I've been offering panel discussions, workshops, and networking events for local female writers and bloggers through the See Jane Write organization and I've made name for myself among local editors in the process. I landed my freelance gigs with UAB Magazine and WBHM 90.3 FM because of See Jane Write. By striving to help people make their dreams come true I began to realize my dreams as well. Have you landed a column with a local or national publication? How did you do it? This post originally appeared at SeeJaneWriteBham.com. Hi! Thank you for your sweet comments you left on my blog! I love your blog and what you stand for and your writing style is wonderful! The name is catchy too ;) Congratulations on your Column, that is so exciting! Thanks Bekka! I'm looking forward to the launch of your new blog! I need them to finish water line venture at the earliest opportunity since issue of water is expanding step by step which has examined in best https://www.paraphrasingtool.biz/best-free-paraphrasing-tool-on-the-internet/ articles. These days we have to begin more undertakings of water lines on the grounds that there are as yet numerous zones where water supply is their best interest. The writeous babe project is written by Javacia she is a teacher and love writing that why she wrote on journalism. She copies her article on the visit site which seems great as she writes it by her own so hew work is good. The words on journalism is so fascinating that everyone should must read the article they will feel great. Examination room are the most exceedingly awful place where I never need to go, no doubt it looks amusing yet it's an unpleasant truth. The worry of exams and full time for hop over to here and consider and no amusements, sports and talking make me so worn out and I simply need to dispose of this. Before long I will get the degree than I will never going to visit this awful room again.